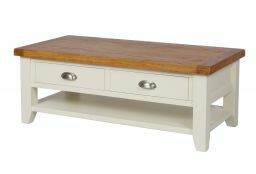 The stunning cream painted Country Cottage Oak Large 4 Drawer Coffee Table. 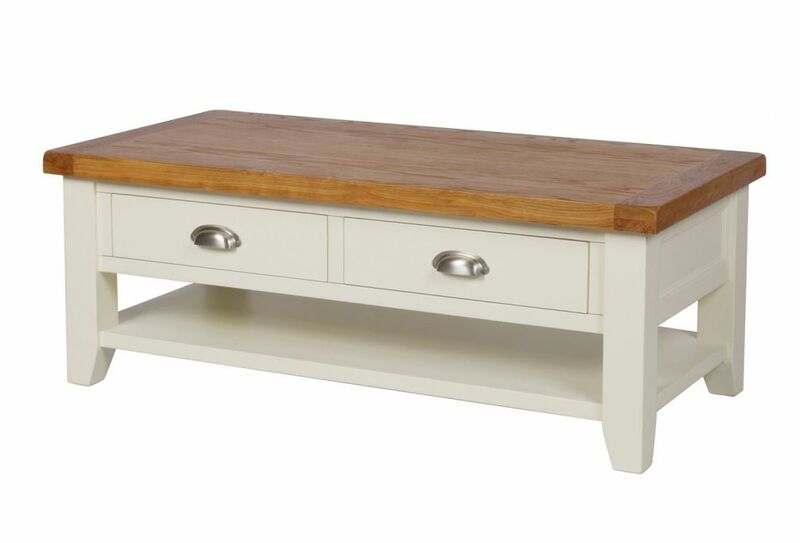 This coffee table is an excellent addition to our Country Oak Cream Painted Range which we offer many different products in such as dining tables, bar stools, sideboards, coffee tables, TV Units and Bedroom Furniture. 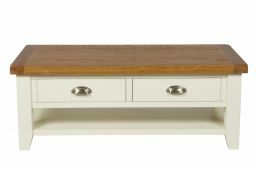 The Country Oak cream painted coffee table is manufactured with an American Oak top which is sourced from sustainable forests. The oak is then beautifully finished with an oiled wax which brings out the natural beauty and characteristics of the oak. very nice solid piece of furniture, delivered on time and well wrapped for protection. Excellent quality and I really appreciate that it came pre-assembled. 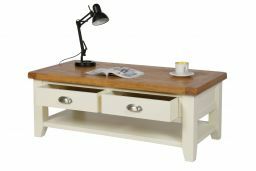 The clever design of the two large drawers means they can be accessed easily from either side, meaning you can change where you want to put the table - i.e. free standing or agains a wall, and still have full use of the drawer spaces. 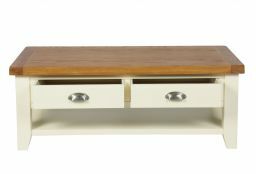 Really lovely oak coffee table, finishes of our lounge beautifully. Service was great from start to finish. Very pleased with my purchase thankyou. The table was delivered earlier than expected by a pair of friendly and courteous chaps. The table itself is exactly as I hoped it would be and was good value. Would happily use again. Excellent quality. Well packaged with fast delivery. Fantastic value for price. Would definitely purchase from this Company again. Was apprehensive about ordering before seeing them but so pleased we ordered 3 items of this range. They are excellent quality. 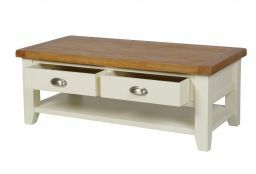 I ordered thisthis table along with the small cupboard. They arrived extremely well packaged, and are of really good quality. As mentioned in another review, the handles are attached with the screws going through the plastic covering but this is easily sorted by undoing them and pulling the plastic out. The delivery drivers were helpful and polite, although due to traffic they arrived later than anticipated. I contacted customer services with some feedback, and received a prompt and polite reply. The table looks good, but the handles have to be removed to get all the plastic covering off & the table top isn't solid wood so sounds a bit hollow.